A former eBay software engineer who worked on the marketplace's selling tools has launched a new tool of his own called Wonder Lister. Chavi Rastogi created the tool to fill the void after eBay retired Blackthorne and he designed Wonder Lister to help sellers load listings quickly and easily, even when uploading thousands of photos. EcommerceBytes spoke to Rastogi about why sellers of all sizes might want to use the tool; and also spoke to a seller - who was one of Blackthorne's heaviest users - about why Wonder Lister is now his listing solution of choice. Sal Militello, who sells stamps and other postal collectibles on his eBay Store Seattle Stamps Covers and Coins, was up the proverbial creek without a paddle when eBay retired its Blackthorne tool. It was a serious hit to him because he put a lot of time and investment into it, said the Seattle-based seller. "I was one of Blackthorne's top users. I think there were three or four ahead of me." Above: Screen shot of one of Wonder Lister's screens, "Bulk Edit"
Militello says he tried other solutions, including eBay TurboLister, but with 20,000 photos, none was able to fill his needs. With 15,000 listings running - soon to be 20,000 - he said, he needed a solution that could handle his level of volume and the other capabilities he required for his business. Help, to paraphrase the Monkees song, was on its way. "As chance goes, the owner of Wonder Lister contacted me, and because he (had) worked in the Blackthorne group, he knew I was a power seller," said Militello. "He got a hold of me and a few others, and I signed up and I thought "Oh my God, finally I've got a chance here!"" Wonder Lister is the brainchild of Chavi Rastogi, who had worked for eBay on both the web-based as well as on the desktop-based products, but all of his development work was on eBay's selling tools, he said. 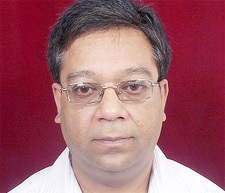 "So I have an in-depth knowledge obviously of how eBay works as far as tools are concerned," said Rastogi. "My thinking is that no matter what, I have a lot of experience with web-based tools, and there are lot of users who would want a desktop solution," said Rastogi. "So since eBay lost their solution, that's where it all came down," he said, adding that he reasoned, "There are not too many good tools out there in the market, so that was a big reason for going into it right now." For Militello, in Wonder Lister he finally found a tool that offered the flexibility that Blackthorne did. "I really liked Blackthorne because they got used to it and got to be easy. And because pretty much you change whatever you need to change and en masse," he said. If you're a jewelry seller or a coin dealer, and work with "those kinds of things you reuse over and over…that's what Wonder Lister is perfect for," he added. Militello also likes that the Wonder Lister tool is "really fast, because it's architected really well." And as opposed to some other tools, he says it's really simple to set up a listing. He also said, "The other good thing is, you only pay for what you use." 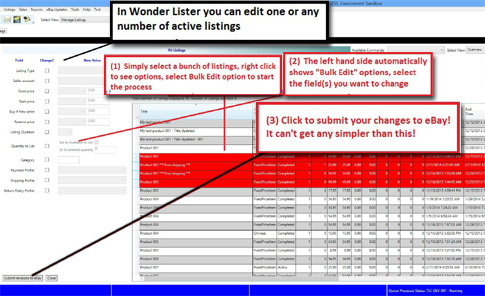 Wonder Lister has a pricing structure where the more listings you create, the more you pay. It starts at $5 a month for a maximum of 50 active listings, and then $10/mo. for 100 active listings, and so on, up to an "unlimited" number of listings for $75/mo. "Once you reach that level where the ceiling is, then you can go to the next level," said Rastogi. "And gradually as you become more and more successful, you gradually pay more and more," he added, up to the cap of $75/mo. A Bulk Lister which "allows you to list multiple products with a single click based on each product's inventory and the latest listing." An "easy to use one-page lister that makes the process of listing on eBay quick and easy." Bulk editing - "Lets you edit any number of active listings all at the same time." Define your own Item Specifics. Bulk change Item Specifics and apply to any number of active listings. Import your Products using a flat file (CSV format). Data Export - Export data in various formats - CSV, HTML, PDF and RTF. Define your own automation rules to create listings. Rastogi points out that you can create your own rules with the tool. "Let's say for the very first time you're selling iPads, for example," he said. "You have to create a listing to start with. But once you've created one listing, that listing you can use to keep on creating listings and creating automation rules. For example, a rule could be whatever you have left unsold, you can relist it and drop the price by 5%. Or whatever the rules you set up. And moment it sells it will automatically relist," he added. And you have the option to edit manually if you want to. "But you don't have to," said Rastogi. Rastogi said that although Wonder Lister only works with eBay for now, he plans to add the Amazon and Etsy channels soon. Currently, the tool is only Windows-based, but Mac users could use it by running Windows on their Mac PC. When asked what he would add to or change about the tool, Militello said just the aesthetics, and is looking forward to more inventory reporting and management tools that are under development. In terms of marketing, Rastogi says most of their customers come from word of mouth. "We do have social marketing," he says, "for example we have our own Facebook page, but absolutely I agree these kind of tools typically spread by word of mouth," he said. "The people who are satisfied always give you good feedback."